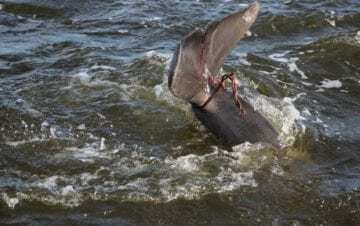 A network of government agencies and concerned citizens teamed up to rescue a bottlenose dolphin that was entangled in fishing gear in the Roanoke Sound near Pirate’s Cove around Channel Marker 27. On Oct. 2, a caller to the Outer Banks Marine Mammal Stranding Network said the dolphin would surface and then an orange buoy would follow and then both would disappear. After six hours of determined efforts, it only took Bruce Crostic of the Division of Marine Fisheries a mere second to cut the line that entangled the mammal. The team was thankful for Crostic’s quick actions that set the dolphin free. For members of the stranding network such as Rachel Potts, an educator at Jennette’s Pier, the experience turned out to be a positive one. Potts is referring to her role as a lead first responder for the stranding network. This group responds to calls about dolphins, seals and even whales found on Dare County beaches and in the sounds from South Nags Head north to the Virginia line. A large truck and equipment is staged at Jennette’s year-round. The National Parks Service responds to calls at Coquina, Oregon Inlet and on Hatteras Island. 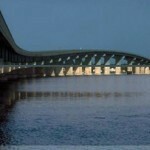 They also provide space for a centrally located “whale shed” with refrigerated storage and supplies near Coquina Beach. 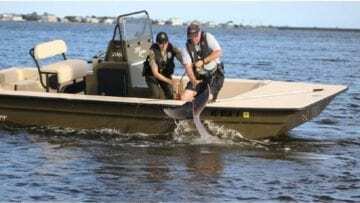 So far, the commitment has included recurring training classes and dozens of trips to examine stranded, deceased and dying animals on the beaches and along the shores of our sounds. In most cases, Potts explained little can be done to help these animals when network volunteers respond. Regardless, strandings provide scientists an opportunity to collect data on creatures with which we rarely interact. This important information on the biology and health of marine mammals provides insight on the health of our marine ecosystems. That’s why this rescue meant so much to Potts and the rest. This animal got to swim away to continue its life in Outer Banks waters. When she first arrived on the scene, Potts was scanning the sound with some powerful binoculars from a private dock near Ballast Point, where the dolphin had first been spotted by a resident that morning and reported to the hotline. All of a sudden she heard the animal surface. After that, Karen Clark of the North Carolina Wildlife Resources Commission (WRC), and Potts took a local boat out to try to assess the situation. Clark helps coordinate the Outer Banks Marine Mammal Stranding Network from where she’s based at the Outer Banks Center for Wildlife Education in Corolla. According to her timeline of the rescue events, it took from around 11 a.m. to just after 5 p.m. to locate the animal, get boats to the area and finally, to be in just the right place at the right time. Clark said the team of Anna Barbosa of WRC and Crostic of DMF were able to snag the crab pot buoy lines trailing behind the animal with a boat hook from their vessel. Clark said the animal was only impacted by them pulling on the rope for about 20 seconds before Crostic cut the line and the dolphin took off. “Bruce cut the line and the animal swam off quickly,” Clark said. A small amount of line remained around the tail stalk but responders are optimistic that the knot is loose enough it may shed on its own, she added. The teams, working from side by side boats, next pulled up the buoy, which pulled up a crab pot. Clark said it appeared the initial pot had tangled with two additional ones. Crostic took possession of the pots for Marine Fisheries. Clark stressed that no one is blaming the crabbing industry for the incident. Looking at the wounds, network experts think the animal was entangled no more than a day, Clark said. “Thanks to the quick actions by the original observers, the community, and the network, the animal’s prognosis for survival is very high,” she said. It’s hard to say whether or not the dolphin a “resident” of the area or migratory one, Clark added. She also thanks Jamie Moore who assisted the first water search of the rescue with his airboat and charter boat captain Marc Kerns took Clark out in the second sweep. In the end, the group achieved its goal and everyone, including the animal, went their own ways. “Everyone worked together really well, I’m glad it worked out,” Potts said. The stranding hotline number is 252-455-9654.
marine fisheries and fish cops around here that could helped. Great job done by a few dedicated people.